CSF-Brazil recently hosted the seminar "Implementation of Environmental Reserve Quotas (CRA) in Brazilian states" to help promote more economically efficient and environmentally sound forest conservation, in partnership with the Federal University of Minas Gerais state (UFMG), the Forest Code Observatory (OCF) and the Environmentalist Parliamentary Front, on December 7th at the House of Representatives in Brasília, Brazil. More than forty people attended the event, representing the Ministry of the Environment, the Environment Secretariats of thirteen states, non-governmental organizations, research institutions, national and international universities, as well as the organizing institutions. Speakers of the CRA seminar. Photo credit: Cleia Viana/House of Representatives. But what exactly are CRA? In Brazil, rural properties play an important role in biodiversity and natural resource conservation, as owners must maintain at least 20% of their total land area with native vegetation. These areas are called “Legal Reserves” (LR) and are intended to maintain forested areas and their ecosystems, ensuring ecological balance in the region. However, many properties have yet to meet these requirements resulting in a deficit of LR. Established in 2012 by the Forest Code, the CRA are one of the Brazilian law compliance mechanisms. The CRA program creates a market through which landowners, with LR deficits from as early as 2008, can meet their legal obligations by purchasing quotas, and thus protect an equivalent ​​native vegetation area located on other properties. The purpose is to discourage owners of native vegetation areas from deforesting it by, instead, making it a source of income through its preservation. Moreover, this market mechanism has the potential to be a very efficient conservation tool for priority areas for conservation and sustainable use of biodiversity, as they are classified due to their high value and according to their relative degree of biological importance. The first step of the implementation process is the definition of the CRA market regulation at the federal level and the creation of its operating system. It will then be up to Brazilian states to regulate CRA use and transaction conditions within and among states. According to the OCF, the federal regulation was expected by June 2017. As it has yet to be released, it leaves the implementation of CRA at the state level in limbo. Meanwhile, several technical studies were carried out by researchers from NGOs and universities, analyzing the economic, environmental and legal frameworks of CRA, thus generating more data to support the regulation and implementation processes. CRA seminar participants in Brasília. Photo credit: Cleia Viana/House of Representatives. 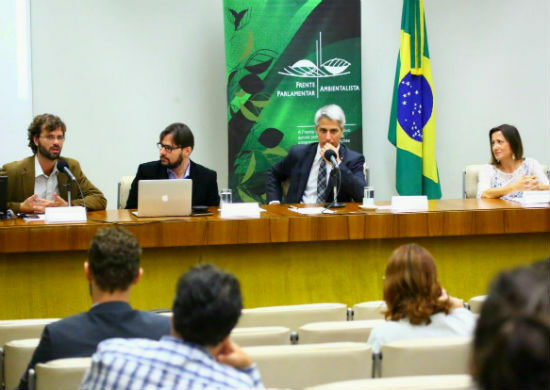 In this context, the seminar sought to provide an open-space to exchange experiences, knowledge, perspectives and bottlenecks for the regulation of the use of the CRA instrument in Brazilian states. The ultimate goal being to promote the incorporation of the technical guidelines into future state regulations, thus promoting more economically and environmentally efficient forest conservation. Presentations included: the timeline from Forest Quotas to CRA; the value and potential quantity of CRA markets in several states; potential buyers and sellers' perception of CRA; issues about mechanisms for CRA market adjustments, such as the possibility of CRA's trade within or among states; definition of priority state areas for conservation and models for compensation rates; the potential of a common platform to evaluate areas for both CRA and Payment for Ecosystem Services (PES) programs; regulatory and legal options for the market and CRA's validation; and the experiences of the states of São Paulo (SP) and Mato Grosso do Sul (MS), the latter already issuing CRA, even before the federal regulations approval. After the presentations, discussions were opened up for reflections, perspectives, proposals for guidelines and next steps. Pedro Gasparinetti, CSF-Brazil's Executive Director, presenting on the concept of priority areas for conservation and CSF’s technical paper on the topic. Photo credit: Cleia Viana/House of Representatives. During the event, some state managers expressed their concern about the delay of the federal definition of the CRA regulation. Deforestation rates are high in certain states - with thousands of hectares of forest lost in just a few months -, thus making it urgent to take a rapid action to avoid higher losses. CSF-Brazil's next step is to launch a study exploring strategies to promote a more efficient operation of the CRA mechanism, as well as for forest compensation in a broader way, incorporating the lessons learned during this event. This publication will be widely disseminated, as well as shared with all the seminar's participants. This seminar and our study are supported by the Good Energies Foundation. Please, click here for more information about this project. Presentation on the concept of Forest Quotas. Photo credit: Cíntia Andrade. For more information about CSF-Brazil’s analysis - concluded in 2016 - about different CRA implementation scenarios in the state of Bahia, northeastern Brazil, please click here; to download our complete study, here (publication is in Portuguese); and to read it's summary, here. To know more about our study - published in September 2017 - of a forest compensation mechanism design based on flexible compensation rates, to be used to define priority areas, click here; to download our Policy Brief, here and Technical Series, here (publication is in Portuguese); and for more information about the different steps of our project, please, click here.